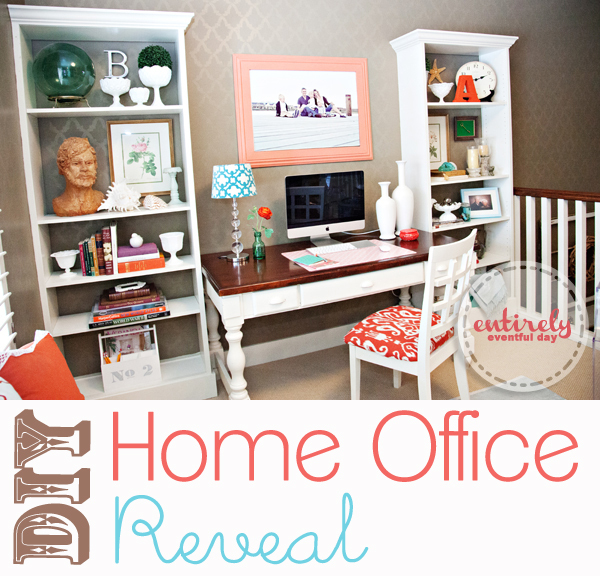 I have been anxiously awaiting the opportunity to share my home office design with you guys! This is where the magic happens... that is, if you consider blogging to be magic. I love this colorful and cozy space, and I hope you do too. My home office is actually also my front room. So it has to be pretty right? My Auntie once told me that, "The first room people see should make them die to see the rest of your house." I really took that to heart when designing this space. 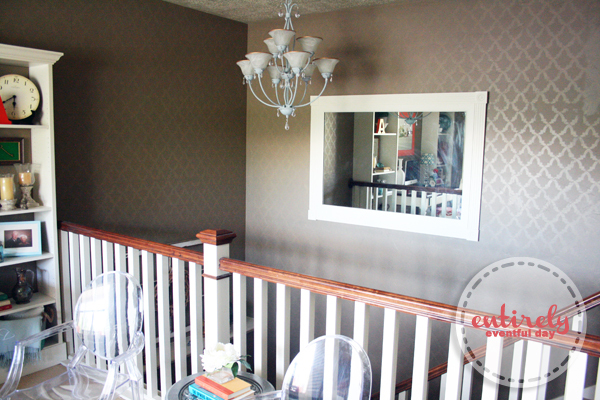 I decided on a neutral greige for the wall color (Quiver Tan, Sherwin Williams). 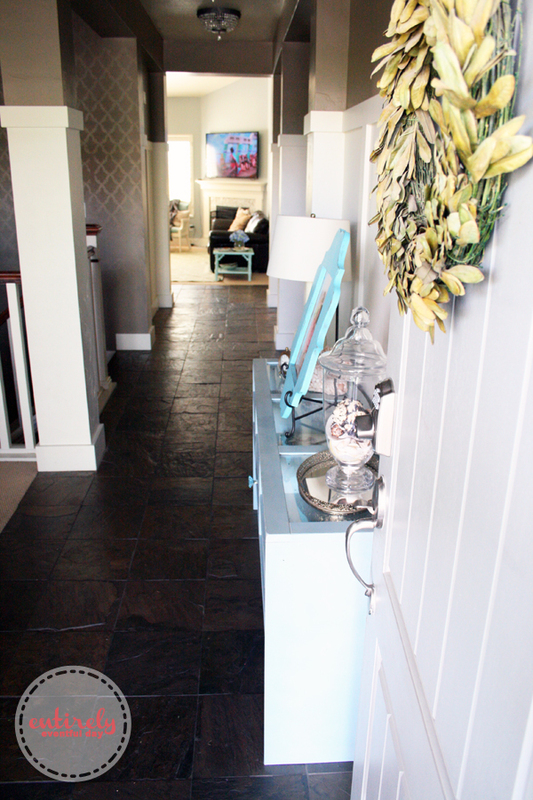 I love this paint color because it contrasts so well with the white (Almond White, Kwal). 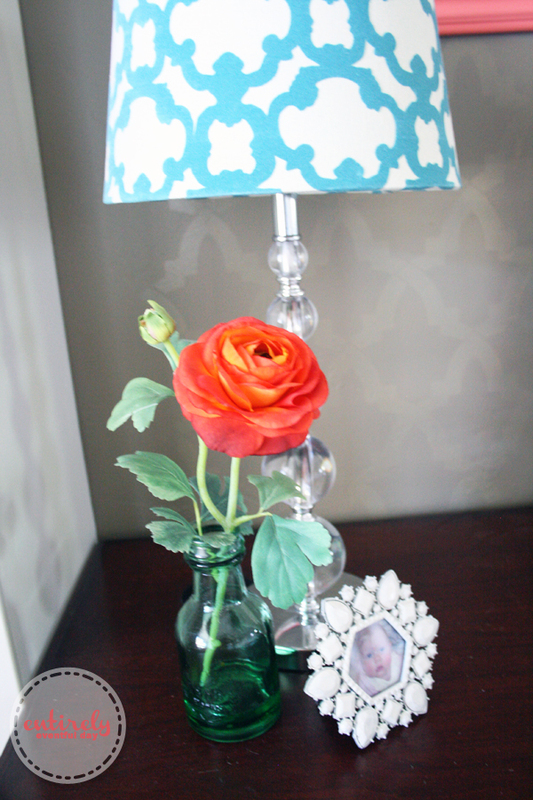 And, of course, coral and aqua accents to brighten things up a bit. I love a good pop of color. 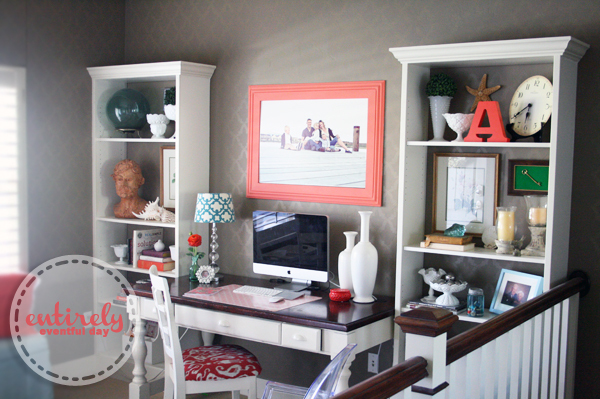 I built this coral frame from moulding (how to build a custom frame). And those shelves are Billy bookcases from IKEA that I "hacked" and "built in." The desk I found years ago at Costco. It used to be black but I spray painted it "Heirloom White." 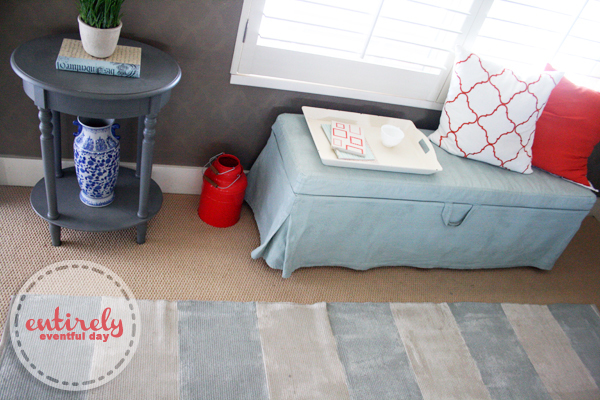 I painted the rug. 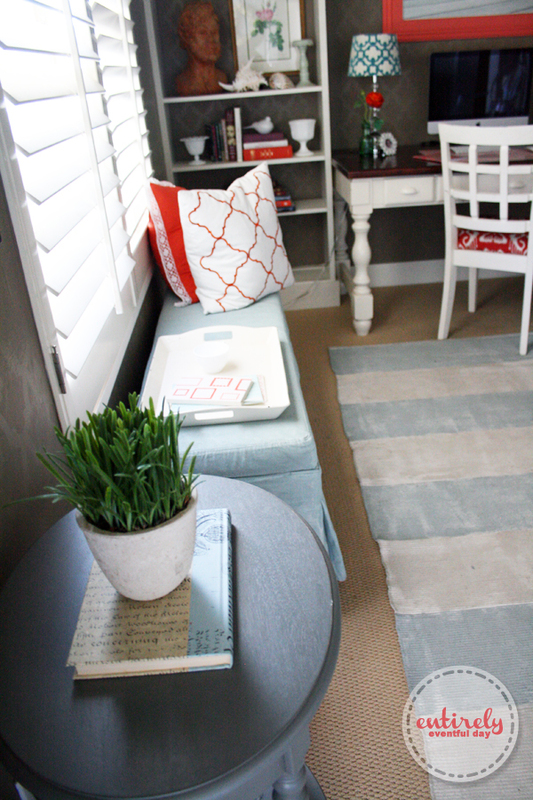 It was just a flat woven IKEA rug, I added some gray stripes. When the white (unpainted) stripes got too dirty I painted them the color of the dirt (ha). My husband thought I was nuts, but it worked perfectly and it doesn't show dirt any more. The bench is an IKEA bench that I got at a yard sale. It was white but I painted it. Have you ever painted fabric? I do it all the time. You just have to add a little fabric medium to your paint. I found the cute pillows and gray table at TJ Maxx and the coral vessel at IKEA. 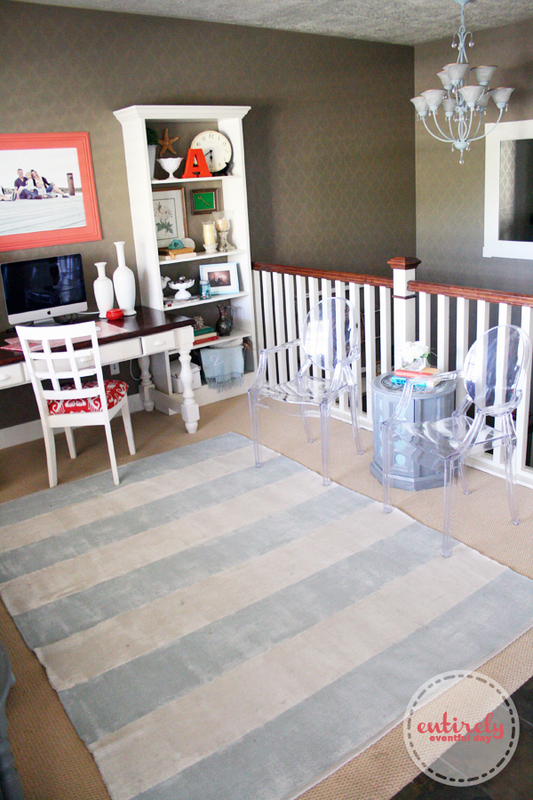 The chair is reupholstered with a great coral IKAT from Calico Corner. And, Of course you recognize the custom desk mat made with wrapping paper. Notice that little glimmer on the walls? 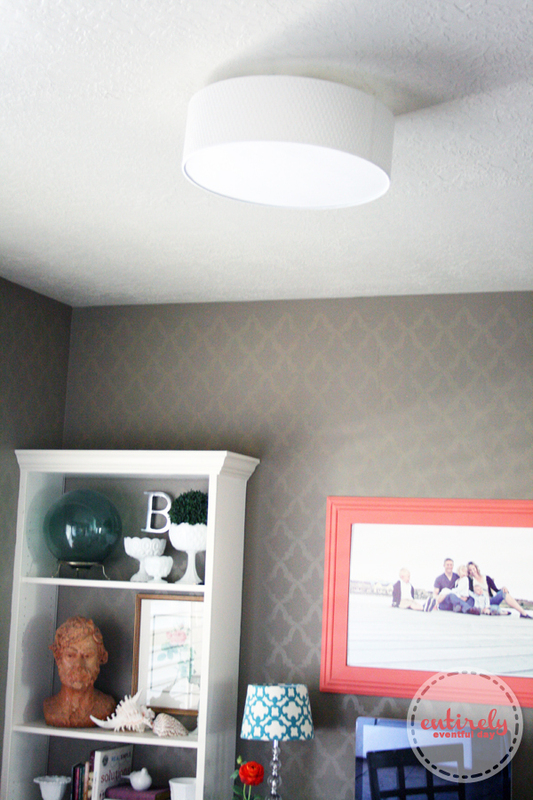 This stencil job was actually super easy to do and I love how it ties the room together. 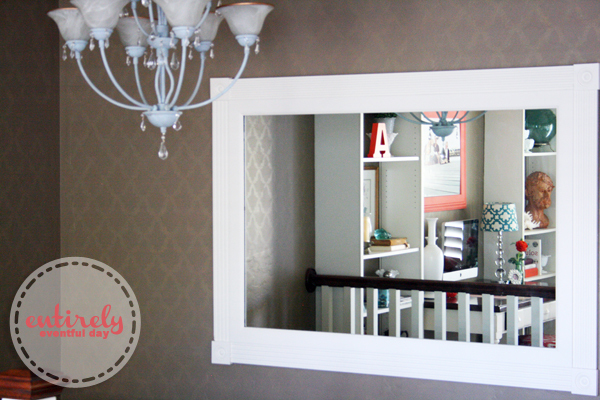 That big mirror used to be a thin framed, brown mirror until I added moulding and trim. Now it looks so custom and expensive. I just got those little pieces of square trim at the hardware store for the corners, it added detail and I didn't have to worry about miter cuts. I painted the bannister spindles Almond White. I used acrylic paint, which goes on better, dries harder, and lasts longer. Ask your paint guy (I love Sherwin Williams guys). 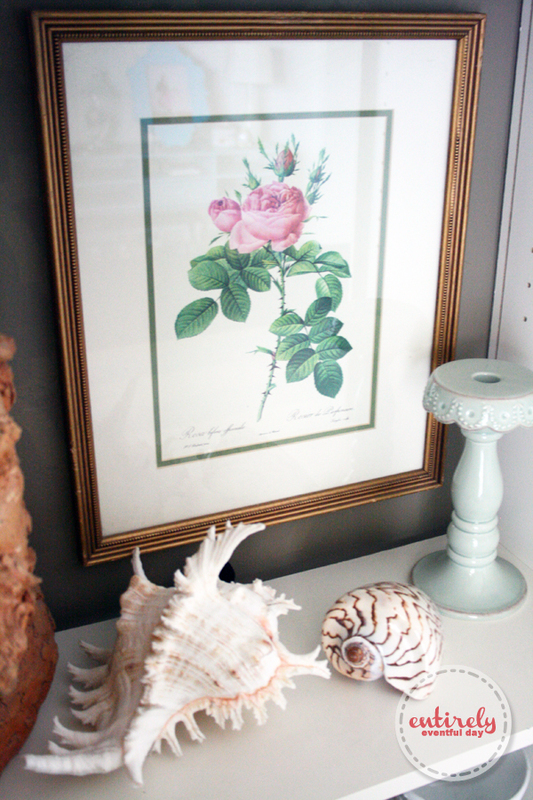 My bookcases are styled with vintage finds. 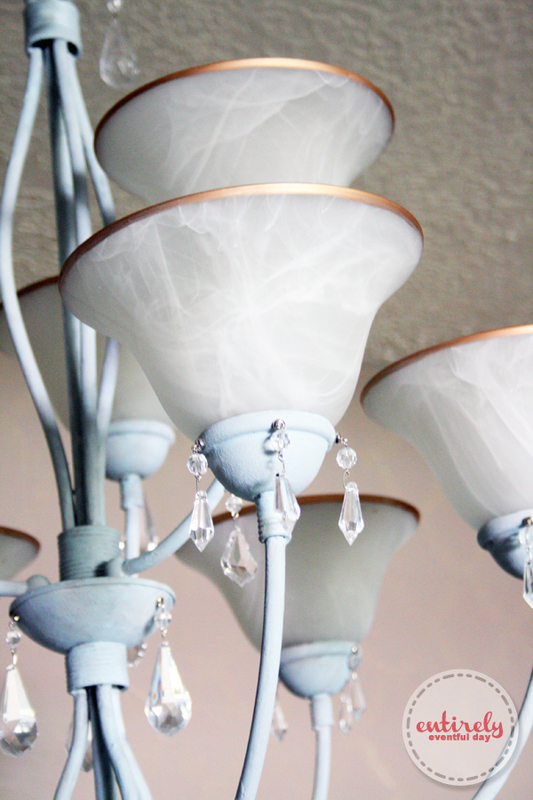 I love decorating with milk glass. 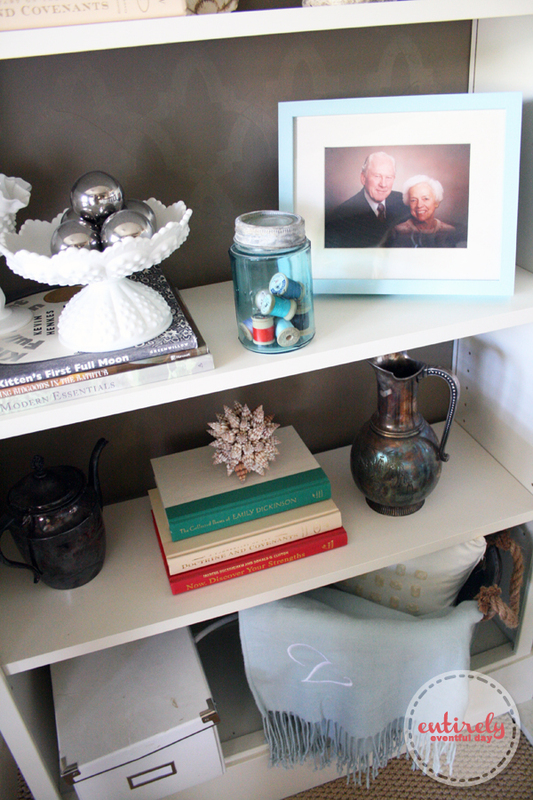 My tip for bookcase styling is to keep it simple, edit, try different arrangements until you find something that works. I am a firm believer in light fixtures. In my office itself, I opted for this awesome IKEA light fixture. I love these, they are so inexpensive and they look so great! I was careful to keep my accessory color pallet simple. 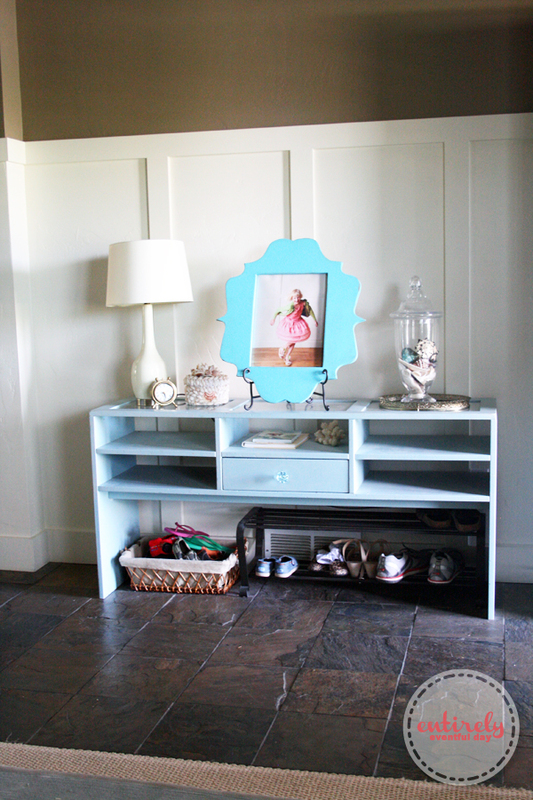 That way I can display several of my special items without clashing with or distracting from the room. I love flowers and seashells. I think every room would have at least one organic element. Oh, and cute pictures of my kids as babies. This is the landing. When I sit at my desk and look to my right, this is what I see. So I needs to be pretty. It used to be an awkward shelf of drywall (I don't even know how to explain it). But I added some really thick MDF and some crown moulding underneath and made a custom-looking shelf. 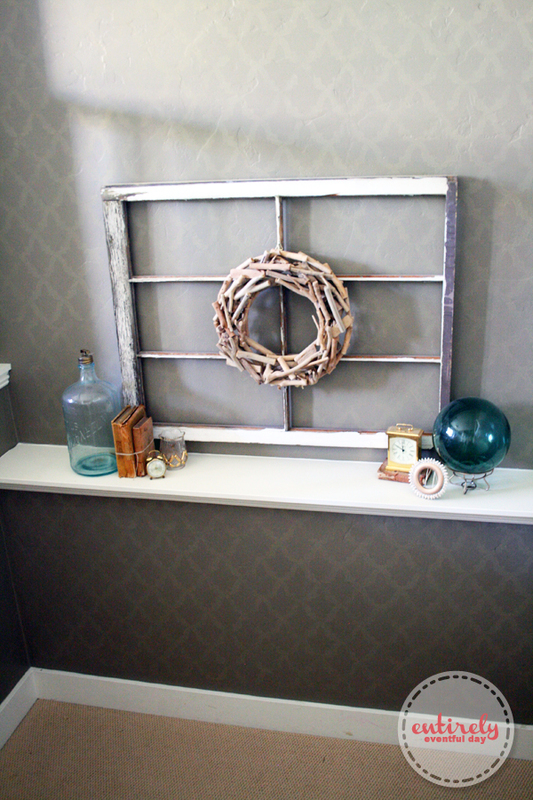 Accessorize with some vintage finds and a driftwood wreath, and you are good to go. 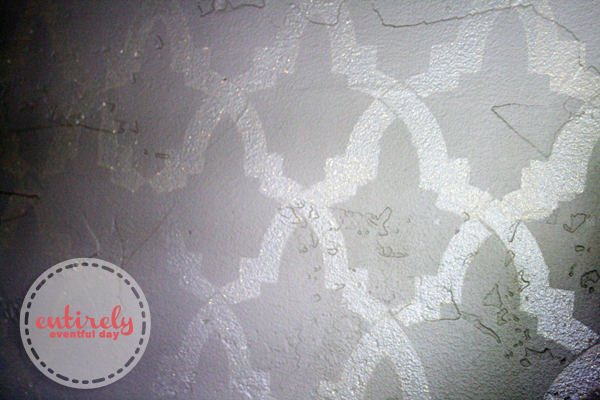 Here's a close up of the stenciling. Yes, yes I did add glitter. I super love my ghost chairs. I think I paid about $75 each for them. I friend found them on a local classified site. Do you think it would be awkward for my to be buried with them? 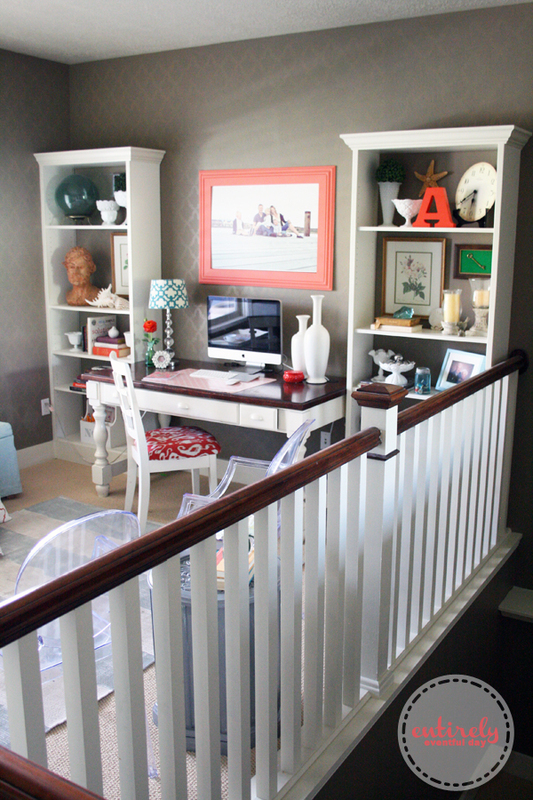 I love them in front of the banister because they are so light visually. I needed sitting but didn't want to block the visual of the banister. Hello cute solution! 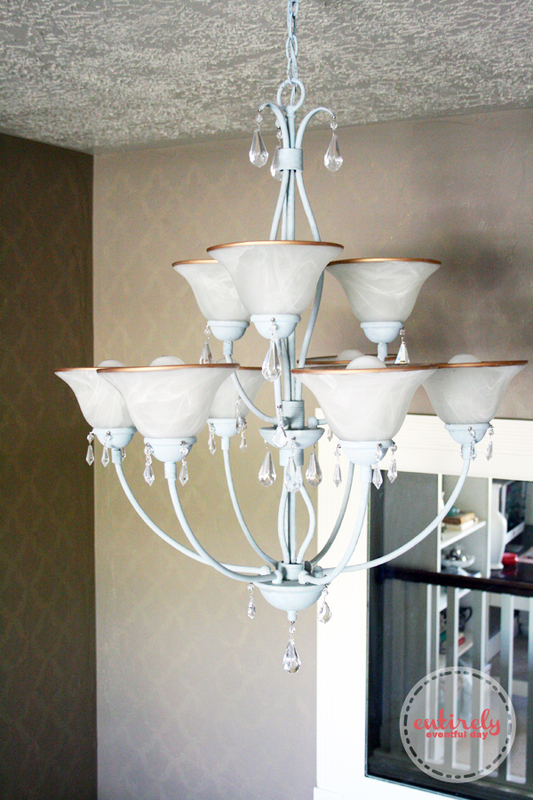 Ah, my chandelier. I posted all about it last week. Doesn't it just make you giddy? This is the wall opposite my desk. This table used to be the ugliest thing ever! Someone was going to throw it away. I didn't even think it could be saved but my friend made me take it. I am so glad I did. I adore it now. 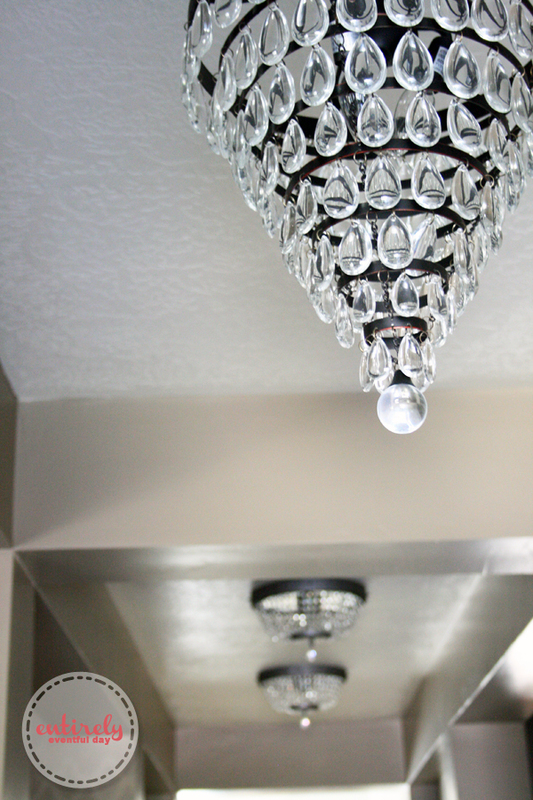 I also adore my light fixtures in my hallway. You should see the shadows and rainbows they cast of the walls at night. I am a huge fan or crystal. (I got both these fixtures at Lowes). 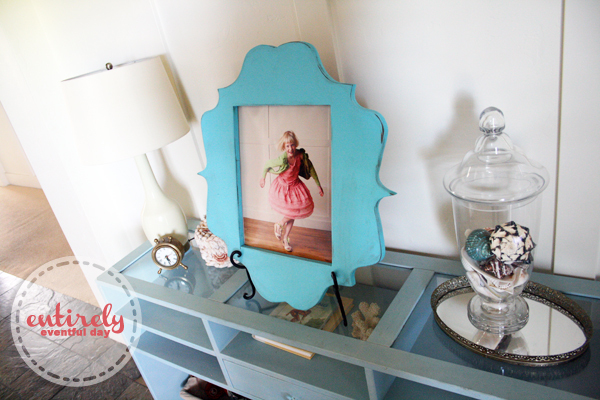 I styled my entry table with seashells, a cute kid picture, and vintage goodness. 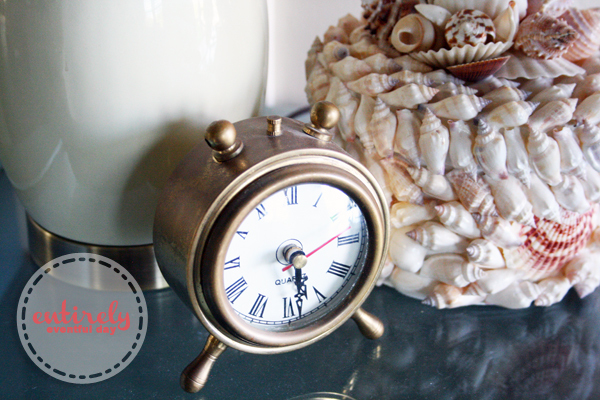 Fact: you can never own too many old brass clocks. Here is the view from my front door. 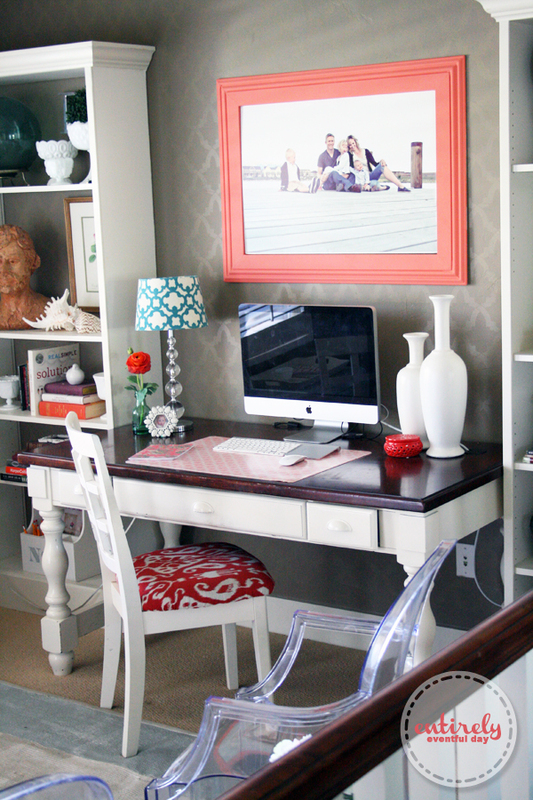 I hope you have enjoyed this little peek into my home office. (Yes the TV is on, how else was I supposed to occupy the kids while I took photos of the room?) 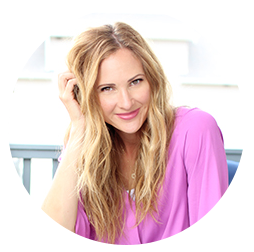 I would love to hear what you think about the space!